Before I moved to China, my version of cooking was Trader Joe’s frozen meals and mixing together a few things in an attempt to make Mexican food. So when I crash landed in “The Middle of Nowhere China” and had only 3 restaurants within walking distance, I needed to learn how to cook fast. Most people eat out because they’re too lazy to cook. Well, I learned to cook because I was too lazy to leave my campus, and I didn’t always feel like eating dinner at 5pm in the school canteen. I learned to cook in China, with fresh Chinese ingredients, a wok, and a rice cooker. Which is why I was so excited when Jessica reached out to me to tell her story about exploring Chinese culture through cooking in her own teacher’s apartment. Teaching abroad in China is an adventure, and so is learning to cook Chinese food! It had been raining for a week, nearly nonstop, but as I rode my red, child-size bicycle across the street to the family-owned vegetable stand to buy the necessary ingredients for “something American,” a strange feeling warmed me. I was excited to go home and cook. Before I moved to China to teach English, those two words never would have been in the same sentence. I was not interested in the patience it took to prepare anything requiring the use of an oven or a stove. Putting hours into cooking was something I saw as a waste of time when I could quickly throw together a sandwich or salad or, better yet, meet the girls for happy hour and fill up on wine and hors-d’oeuvres. 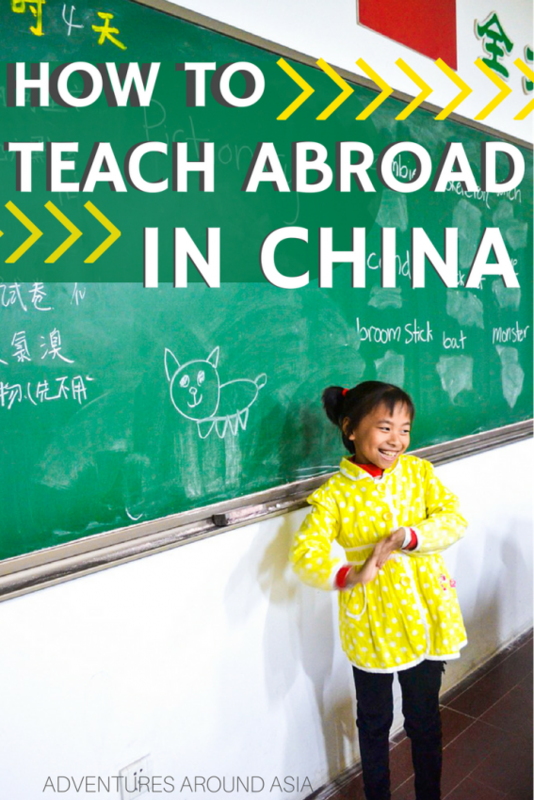 Try the Free Teach Abroad Mini Course! Over a year ago I accepted a teaching position at a university in Guangdong, China’s southeastern-most province, and girls’ night out transitioned from swanky wine bars and fancy restaurants on the river to sidewalk food stands and dinner served in miniature urinals (the literal tableware of a restaurant chain called Modern Toilet); the hors-d’oeuvres shifted from hummus plates, sliders, and bruschetta to chicken feet, stuffed snails, pig hooves, and larvae. I’m adventurous when it comes to someone else’s cooking, but overwhelmed by the process when I’m the one behind the counter. In China, my abilities are limited to boiling, frying, microwaving and heating food in a rice cooker. My apartment kitchen is equipped with exactly one pot, one pan, one wok and several small bowls, along with chopsticks. I don’t have an oven or a dishwasher. My kitchen sink is the size of the smallest drawer in my mother’s fridge in Oregon (a fridge in a state-of-the-art culinary kitchen sure to make any professional chef jealous; a kitchen that I never once took advantage of before), and the table space surrounding it is shared with a gas stovetop, which leaves me no more than four inches of counter to use in any one direction. My original ideas (chocolate chip cookies, pizza, brownies…if only to satisfy my own desires) were exhausted with the realization that I don’t have an oven and my budget isn’t large enough to allow for such “Western” commonalities as cheese and chocolate. I was forced to settle on something much less appealing but just as American: potato salad. I tuned Pandora to the Eagles 50’s Station, maxed out the volume and set my only pot on the stove to begin boiling water. I had 21 students to feed, which meant at least 12 large potatoes (I was aiming only for taster portions) and three separate rounds to boil them all. As I washed the potatoes and peeled them with a knife, I sang and danced to tunes such as Fleetwood Mac’s “Dreams” and The Temptations “Ain’t Too Proud to Beg.” I felt warm, despite the temperatures that had bogged me down for days, and relaxed, despite my usual anxiety to be doing something more productive than cooking. It took close to three hours before the potatoes were cooled, eggs boiled, bacon fried and celery chopped. I divided the salad into three mismatched bowls and placed them in the narrow refrigerator that stands as tall as my shoulders. I felt a feeling of accomplishment similar to the feeling I have after a daily four-mile run around the University’s track; a rewarding sense of pride. The potato salad was a huge hit in class. They gathered around the bowls and shared the meal like they do all others. The smiles I earned from my students were brilliant and appreciative, and whether it was genuine or polite affirmation, they all said they loved it. I was elated, and I never once felt it had been a waste of time. Since that day, I’ve attempted to make breaded balsamic chicken, grilled eggplant, Chinese style fried egg and tomatoes, soy yogurt (in my rice cooker! ), sweet potatoes with carrots, and a variety of pastas and soups. Most were successful, others failed, but it’s a learning process and it’s going to take time. The patience I’ve found through cooking has transferred into a stress relief from other parts of my life as well, like teaching and writing. Jessica J. Hill is a travel and outdoors writer/blogger/addict. She shares more stories at MissAdventureTravel, and is currently recruiting teachers to teach English in China and elsewhere abroad at TeachEnglishESL.com! Find Jessica on Facebook, Twitter, and Pinterest! Have you ever surprised yourself and learned a new skill abroad? Let us know in the comments below! This is a dream of mine – to take cooking classes around the world! It looks like the class you took was tons of fun. Hey Stephanie, I actually learned to cook on my own in China but they do have some great cooking classes here! I learned to cook when I moved to the Netherlands and needed to lose weight, lol. I actually found it really fun, and miss having my own kitchen. When my travels slow down next year, I’m looking forward to relaxing and cooking my own meals a lot more. I definitely agree, cooking can really help with feeling healthy! Living in Beijing, everything is so oily, I cook a few times a week so that I feel better. Love chines food and o lucky you learned how to cook it. the food makes me hungry looking at this article. Hahaha I’m hungry now too! I definitely recommend testing out Chinese recipes if you have the chance. Chinese food is great!